Since 1971, Swimline was known for making high quality pool products; it was the largest manufacturer of in-ground and above-ground pool liners, covers, and all related accessories. In 1990, the company expanded their product line to pool toys, games, fun floats and accessories… what’s really interesting is that Swimline dove into the water sports market in 2007 with its new emerging brand Solstice, making some of the greatest inflatable boats, kayaks and standup paddle boards, in an attempt to capture the full spectrum of the industry. Swimline did a great job with each and every product of theirs ever since they launched their line, and they’re still going as strong as ever to continue what they’ve started. 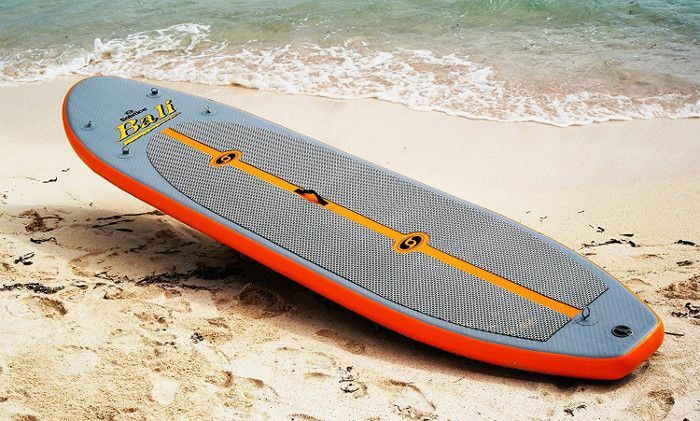 This review is going to present everything we know about one of the Swimline’s iSUPs; the Bali, which is known for being one of the best inflatable stand up paddle boards in the market. The Bali is 10.8 feet tall which might not be considered large, but I give you this; it’s big enough for anyone who is around 250 LBS, making it suitable for almost everyone starting with entry level paddlers up to advanced ones who are seeking a beneficial recreation time. 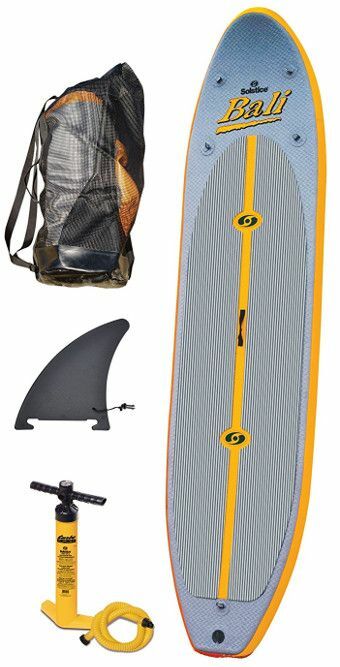 Its shape screams versatility; as a result, you can use it for touring, soft surfing and yoga. That being stated, yoga needs balance, and the Bali has it with a width dimension that measures 30.5 inches. It’s basically the best you can find in the market concerning this aspect; most quality iSUPs measure 30 or 31 inches for width, while it’s rare to find an iSUP that is wider than that. The Bali, thus, is proved to be a sturdy and stable iSUP. As for thickness, this board is 4 inches thick which I’d argue it could’ve been better. However, I can’t say that I’m disappointed with this figure, because simply; the Bali fulfilled most of my expectations and hopes delivering a smooth performance. 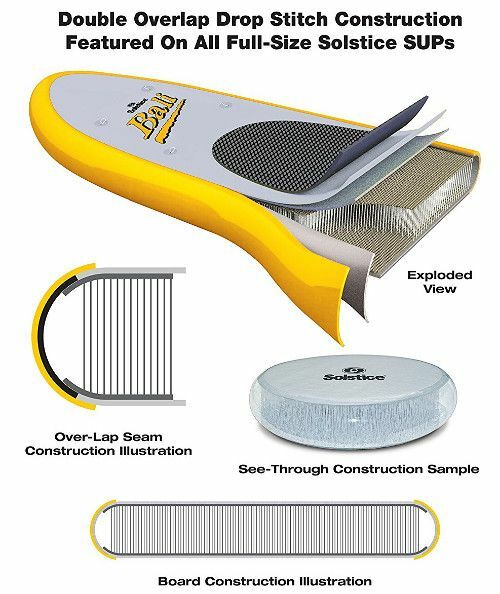 All great iSUP manufacturers agree that in order to build a durable board, strong materials need to be carefully chosen. The Bali is made of Durable 1000 Denier 3 ply PVC reinforced fabric material which makes it virtually indestructible. Once fully inflated, the board is rock hard, stiff and rigid. The double overlap drop stitch construction allows this board to beat the natural circumstances for a long time. Also, it’s a well known fact that the better care you take of your board, the longer it’ll last; being a friendly user is never a bad thing. All in all, I think that the Bali’s key performance indicators go up when it comes to quality and strength. The one year warranty might not seem enough, but it’ll do for a durable iSUP like this one. A nice traction pad that covers almost two thirds of the board’s back. It’s thick, grippy and very comfortable for your legs. It also makes the board stiffer adding 4 mm to its thickness measurement. You’ll also find 5 stainless steel D-rings that are rigid and well-built; 4 of which are on the board’s deck, while the 5th one is on the tail for anyone who’d like to use a leash. The thing is that there is no bungee cord connecting the D-rings which is quite unusual. A central carry handle is also featured to make carrying the board around after inflating an easy task. 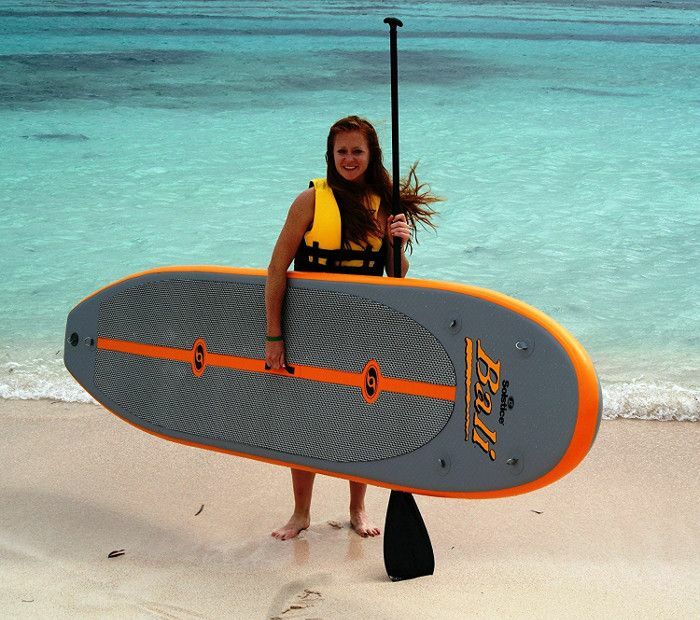 The Bali is featured with 2 small built in side fins, and a central removable larger fin. And a hand-pump and gauge. So, there is no paddle, and no repair kit which is sad to be honest. Yet, I don’t think it’s enough reason for anyone to abstain from ordering the Bali because you can easily find the perfect paddle for you. 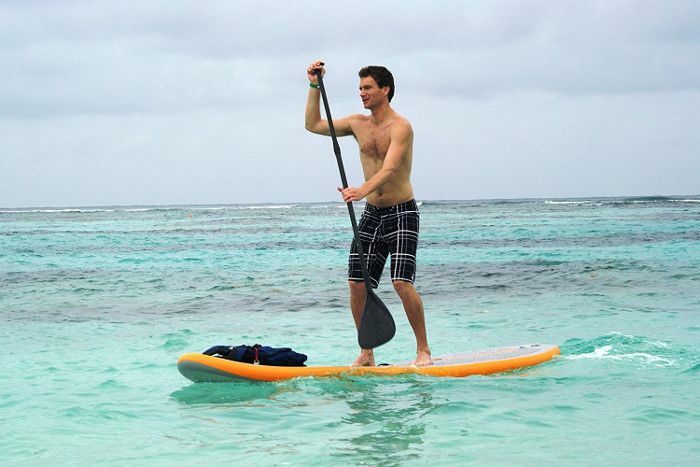 The best thing the Bali is that it’s really easy to handle in water; it’s responsive and even as a beginner you’ll find yourself able to control it. It’s also faster than some other similar boards that I’ve reviewed before. It has delivered a great performance in flat water, and I loved the fact that it is light weighted outside water. You’ll feel balanced and comfortable while paddling because the Bali’s structure and design are meant to support you body and allow you a fruitful paddling experience where you’ll rapidly improve your paddling skills. The Bali is a great budget-friendly choice for beginners. It’s extremely durable and light weight at the same time. The Solstice Bali doesn’t come in a complete package.